Many years ago, when I had gone to Israel to teach, some friends and I went to the Old City section of Jerusalem, where there is a wonderful open-stall marketplace. It is a place teeming with sights and sounds and goods for sale. As we were walking down an alley, one of the merchants called out to me, "I have what you need!" I felt a thrill go through my entire body. "Wow, he has what I need." I stopped, turned around and starting walking toward him. Then I thought, "Wait a minute. First of all, I don't need anything, and secondly, how does he know he has what I need?" In many ways the world is calling out to us all of the time: "I have what you need! I have what you need!" In response we might tend to follow one voice, then another, until we are dizzy and then exhausted. We also internalize those voices into: "I need. I need something. I'm in a state of deficit, of deprivation." We practice meditation to first of all disengage from all those voices, and then to explore what we actually need to be happy, and be able to live that insight. In these 28 days I think you’ll find a wonderful, supportive community forming, whether you are blogging, or commenting, or reading. Together we will work to establish the skills of concentration, mindfulness and lovingkindness that make up meditation practice, and discover where that leads us. Well the start of the meditation challenge is quickly approaching and we need to remember that it is not a Sprint, but a Marathon. We need to make room in our lives for the training and work that needs to be done, just as an athlete training for a Marathon creates a plan. Scheduling the time for ourselves to build the endurance and skills needed for a daily meditation practice. Every day of our training may not be perfect, but the beauty of the practice as Sharon so nicely states is that we can just begin again. I am sending positive energy to all of our fellow bloggers. I think that the biggest challenge for me will be making sure it happens every day no matter what occurs. The good thing is that "Any Meditation is a good meditation." So this is my first blog ever, which may sound kind of weird considering my generation, but it is. Haha. So this is exciting, MY FIRST BLOG POST EVER! I am new to meditation though, and am hoping that it will help me find peace. I have been diagnosed with an anxiety disorder recently, and am hoping that this program may help with some of my symptoms and anxiety management. To be totally honest I was kind of skeptical when I first heard about this, but now I am becoming more and more excited about it. I have had some background in breath control and concentrating on it through yoga, but I’ve never actually meditated before. All I knew about it before this is what I’ve seen in movies or stuff (sitting on the floor all twisted up like pretzel and chanting). I’ve recently been struggling with some obstacles in my life with athletics and injuries, so this is hopefully going to help me with healing also, I don’t know maybe that’s a stretch. But at least it gets my mind off the frustration of knowing I can’t play. A well played tug-of-war. Noise and Vibe Breath In and Breath out I shall return tomorrow. The morning began with the daily routine rush of getting the kids fed and ready for school. After the last kiss and goodbye I make my way back home on the London Tube – the perfect place to start my meditation as I am packed into the rush hour commuter train with little breathing room around me. Being the last passenger to take the plunge inside, I am pressed up against the doors as they shut and the train makes its way out of the station. It is eerily quiet inside as morning commuters find a way to disconnect from those huddled around them heads down buried in Ipads, tabloids or averting the gaze of the passenger they are squeezed next to. I notice my breath lightly fogging the windows of the train door. I tune my awareness to this movement of my breath floating in and floating out, the exhale leaving its mark on the windows as London’s urban landscape whizzes by. I allow my breath to slowly and gently even out creating a sense of nourishment and calm. In the 3 minutes it takes to get to the next station, I have welcomed a sense of spaciousness in the center of my chest. The doors open briefly and no one dares step on or step out of the train, the journey continues in complete silence. I continue to let my breathe flow, allowing my exhale to slowly and gradually travel from my lungs to the base of my belly. This slow release of my breath creates a feeling of calm, grounding and connectedness with those around me. The train begins to reach the transfer stop where commuters will spill out to take other trains to their final destination. Before the doors open, I gaze from side to side and silently thank everyone for sharing such a lovely and peaceful journey. I’m really excited to be here and apart of this virtual community and honored and extremely grateful to share my experience with you. My formal sitting practice has been a bit of a chore lately. So this is also why I’m excited to be practicing in this way. I get to let go of the shoulds ("I should be meditating more") and be reminded of what's important and how short life is and how freaking precious the practice is (which when I see clearly I remember that life and practice are not separate). So I catch a glimpse of my true nature, remembering who I really am and that the element of the truth seeker exists within me and once again i continue to persevere always holding myself with extreme gentleness. Day 1 yesterday. Wednesday Sat for 30 min with community. Set my intention to concentrate on the breath. In and out of staying with the breath as usual and moments of sleepiness. It was perfect. There was no judgment, it’s just was what it was. Another step in the road on this journey of a life time. Pinned up by my desk at work is a little quote from the Dalai Lama – The sun shines with no discrimination…over everything…in all directions. We should be like that. Today was really a roller coaster for me….really on edge. I was glad to leave work and have some time to myself. The quote above was running through my head as I was feeling that I had really been judging people all day and what came to me was that I had really been very judgmental of me. I have a tendency to take on things that are not mine but I am determined to be responsible for them….the difference about today was for the most part…I was present and more aware. 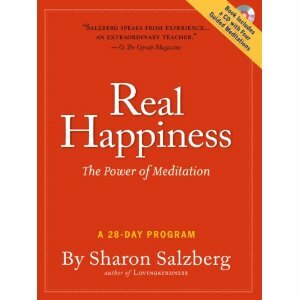 I was reading the introduction for Real Happiness…and at the very end Sharon wrote – “Now I can accept setbacks more easily. With less sense of disappointment and personal failure, because meditation has taught me how to cope with the profound truth that everything changes all the time”. The power of meditation…….. In yoga there is a term for that fire and steadfastness to the practice – it’s called Tapas. It is wonderful to read the posts of all the people that are on this mutual endeavor and listen to their Tapas. And meeting some of my fellow travelers tonight with Sharon at the Tibet House was wonderful. The stories, perplexities and thoughts shared in both the blogs and the meeting are perfect because it helps us to realize that we are not alone. Because, we are not alone. As I drove home along the FDR, I was deeply in tune with that. There is something about coursing south on that road while the river next to me does the same, and all of the lights of the city are like so many stars or atoms, each one of us a pinprick of light flowing and moving into and out of each other’s physical space that I was again reminded of this very basic fact….we are not alone. And it is exquisitely beautiful. We are stardust, we are golden. Right? And then, I came to realize that this act that we have done…by accepting this challenge and moving into it is a Sankalpa. This is a covenant taken with oneself and typically represented by the tying of a red string on one’s wrist. It is a vow of Intention and the string is a reminder of that. We have all of us taken this vow for one reason or another and the string that reminds us to keep at it is quite literally the string of posts written by our fellow practitioners. We are not only writing a beautiful thread, we already are a beautiful thread. Thank you for that. I had quite a unique experience...I will try to capture it in words but am not sure I can do it justice. I was riding on the bus and trying to bring my attention back to my breathing. I noticed that with each breath I was breathing in the space and the air around me and outside. The more I focused my attention on the breath as I was breathing, the more space I felt inside. When this space grew, it left no room for the anxious, worrying thoughts to take over. I got off the bus and slowly walked to my apartment. In front of the building was a still puddle of water, and I stopped and stared at it, mesmerized. The breeze would briefly touch the water, and the reflection would stir a little, then the water would return to its perfect, clear reflection. Amazingly beautiful and a symbol of my experience at that moment. ...A one-of-a-kind experience, but this has happened to me a few times in the past few weeks. I’ve always been interested in meditation, but I never pushed myself to try it for fear that I would fail miserably. A few years ago I was diagnosed with Attention Deficit Disorder (ADD). Every time I attempted to meditate, my mind would wander and I would be stuck daydreaming until I realized 30 minutes had gone by. I felt like I couldn’t concentrate and would never be able to control my attention. As I meditate now, I still struggle with keeping my mind in one place but I’m getting better at staying in the moment and working to keep my mind from swerving off course. It’s challenging but I’m willing to push myself until I succeed. Caroline Kirk, 16 year old student at Winchester High School. I must have started and stopped writing this post ten times this morning. I awoke scattered and tense and when I sat, I felt so restless. This is not generally a problem I have first thing in the morning. I’ve re-dedicated myself to getting healthier and making meditation a daily practice has become my foundation for that path. And by healthier, that generally means lighter. My weight has been an issue most of my life. As I write this, I am stunned by how profound that really is because most of my life means over forty years. Now, I’m very clear that I can take away from this that I’ve wasted a lot of energy worrying, thinking, planning and scheming to somehow change the fact that I’m never going to have the body of a model or I can simply accept who I am and where this body is right now. I’ve never written about my struggle with weight because I’ve always convinced myself that if I don’t acknowledge it publicly, it will change – that I will miraculously shed the pounds with nary a thought. But for me now, it’s really about health. I’ve long given up the desire to look good in a bikini. And I’m guessing I don’t need to broach the subject of body image and young girls. Just when I think our culture is starting to ‘get it,’ invariably I see something in the media that sets us all back fifty years. For me, meditation is about letting go. Literally, letting my brain rest and giving in to that settled feeling that comes with acceptance. As such, my meditation practice gives me something more than any diet guru can provide. It gives me weightlessness. Now that’s a diet I can stick to. Having skipped Friday -- work, dinner out with a friend, the end of a long week -- these all seemed like reasonable reasons I couldn't find the time -- and afraid, really, of just sitting there some more on Saturday morning, of faking my way through meditation again, I decided to browse the book for a few minutes before settling down. 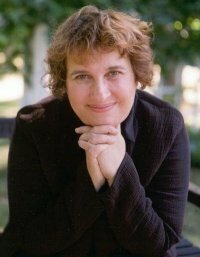 This might of been the meditation equivalent chalking and re-chalking my pool cue because I had no shot, but it is always good to reread parts of Real Happiness -- it seems that there is always something helpful, something that I've forgotten, and on Saturday, I rediscovered the Hearing Meditation. One of the things I cherish about my apartment is, at least on weekend mornings, is its absolute quiet. Paradoxically, I also love the sounds (most of the time) of my neighbors -- this is city living, the footsteps above, the distant phone ringing, the front door slamming. During my meditation I found it helpful to have the sounds of the world to come back to rather than just my breath - the almost imperceptible refrigerator, the far off acceleration of a car, and the sound of birds coming from somewhere. It was though, the sound of the birds that derailed me, putting me in mind of my cat. He was an indoor cat, but nonetheless, he was dutiful about bird patrol from the windowsills. I missed him and for a few minutes it did no good to call myself back to sound. My surgery, his death, these are things I feel like I am handling and not just on a practical level, but somewhere I know, on the deepest level, I don't want entirely to sit still with these things. Even so, sit I did, and for the most part felt more settled and deeper into meditation than I had so far. It's hard to describe exactly the shift I felt during the hearing meditation and there was nothing revelatory in the sounds I heard. It's just, they sounded a little sweeter -- all of them -- than they do in ordinary alert listening. I was sitting on a recent morning and I decided to let the anxious thought trains run their course through my mind. I decided to embrace them and really be with them. And what I found underneath as I kept disembarking from them and getting swept up by others is that they are really imaginary. I was sitting, they were running but they were figments of my imagination, thoughts about what could be, what was, what might be, what I think was, what he thought was, what my child self thought of it all. It was mayhem! Suddenly I realized I was producing these thoughts as a kind of habit. And I realized I hold onto these thoughts as a habit. Holding on to such patterns and accepting the imaginations as reality is very much like the old fable about the monkey with its fist in a jar. It reaches in to get a single peanut from the jar and won't let go of the peanut so its hand is stuck in the jar. There may be many other peanuts around to eat, but the monkey gets fixed on what meager crumb is in the jar. This is what we are dealing with a lot, people. This limitation of the mind. When I feel anxiety, it is as if I have stuck my whole head in a jar and opened my mouth so my jaw prevents escape. I've put my mind on a few petty things (many associations from the past and programmed thought patterns that are quite useless) and fixated there so hard that the rest of the world waits, full of fragrant newness, while I stare at it from the inside of a stale-air-filled jar. After that sit, I got up and had enough space to maneuver further away from the patterns that were related the night before. In that space, I chose to think on other things or just to wait and see what the present moments bring. Sure enough, there emerged a tied of developments and by the end of the day what happened the night before was not even worth a second thought. Let go of the peanut, close your mouth and get your head out of the jar. You won't be free by doing it just once, it's a matter of catching yourself over and over in the panic, in the anxiety and saying "where am I stuck?" Three days and it feels good! I recalled that in one of Sharon's talks at ICT in Washington DC, she mentioned Buddha's list of the seven benefits of mindfulness. I didn't exactly remember what they were so I just looked them up. And the first benefit is purification from the defilements, one of which is sloth and torpor. That's the one. I feel energized. At a recent group sit, people were talking about how their pets want to be with them when they’re meditating. One woman said she was sitting in a garden and a baby bunny hopped up next to her. I had a hysterical giggle fit because this is what I want—baby bunnies in the utopic garden in the spirit hall of meditation. But when I was sitting in our little backyard garden in Queens last spring, I opened my eyes and there was a giant rat sitting in front of me so peacefully. (Luckily my feet were folded up into the chair.) After a moment, it lumbered away. It ain’t fluffy bunnies but it still counts. Being with unpleasant emotions, thoughts, and feelings reminds me of Top Chef. There is always a challenge when the chefs get a mystery box filled with random ingredients and they have to cook with every one. No matter what. Feeling is like that, too. Due to a dizzying, infinite array of circumstances, I have a certain collection of emotional ingredients in my mystery box. And I have to work with them all. Even if one of them is poo. Without my practice, I’m not sure I would have the courage to do that. And that is everything. Doesn't that hamster ever get tired? Full disclosure: In my other web-life, I blog at Uneasy Pink. I am not trying to be icky self-promotional here, just trying to offer context. Since my breast cancer diagnosis in 2008, I have become increasingly immersed in the culture surrounding the disease - the good, the bad and the ugly. Or maybe the support, the co-opting and the branding. In the last couple of days, a breast cancer Goliath has been receiving a whole lot of criticism for some funding decisions. I have been frantic since then -- trying to get my messages out there while people are paying attention; striking while the proverbial iron is hot. It has been exhilarating. And thoroughly exhausting. But apparently only to part of me because the hamster on the wheel has been running day and night. I seem to be utterly unable to unhook from it. And in the process I am becoming unhinged. I sit. I am quiet. I do not say OM. But, I do count my breaths. The silence is full and rich and somehow nourishing. I am enjoying this silence. I am enjoying this lack of doing, of thinking, of planning.... Twenty two minutes. Fifty Breaths. I was waiting for this to happen. The day on this challenge when, well I just wasn't totally gung-ho. It only took 6 days. If I wasn't doing this with you guys what would I have done? Taken a day off and then another and another and before I knew it I wouldn't be sitting anymore. I was waiting too, because I knew that it was going to be my opportunity to overcome some resistance. I have felt so good this week. My energy seems better, I feel more positive overall, curious, grateful, patient and the stuff that was eating at me before I began this challenge has seem to lessen in intensity. Maybe I was feeling too good and not desperate enough to sit? I started to worry about day 29 and what I'm going to do? So, I put Hiro down for a nap. I surfed the web a bit and looked at some houses we couldn't buy, I ate some caramel toffee ice cream and knew that if I didn't go sit soon Hiro was going to wake up and that would be that. I unrolled my blanket, put my cushion down, set my timer and got comfortable. I watched my breath and got lost in some memories and what ifs and then I found my way back to the breath. I did it with somewhat less zest than the previous days but looking at the big picture it was a good sit. I sat on a day that I didn't really want to not just because I said I would but because I am beginning to recognize that not wanting to sit is just a thought. Somewhere in the Yoga Sutras it says that you have to do a practice for a very long time, uninterrupted and with earnestness to yield results. I should have known better. I should have known better than to meditate while my young kids were prowling the house. I thought that I could sneak away and steal 15 minutes, only to return as a refreshed, stress-less dad. Ah, well. I was about 4 minutes into Sharon's breath meditation (Track 2 on the Real Happiness CD), when I was discovered by my oldest boy. I paused the meditation track, and explained that I was listening to a guided meditation. He wanted to join me, and sat next to me. He's meditated with me previously (and I led a meditation session with his class at school last month), so he's familiar with what to do. "Just listen to the woman on the CD, and do what she says." I advised before we settled into our sit together. I closed my eyes and tried to feel my breath, even as I heard him squirming next to me. Sharon spoke for a couple minutes on the track, and then lapsed into silence. My son quickly spoke up, "Is it done, dad?" "Shh," I said. Then, I heard his little brother calling for him, followed by running footsteps to our spot. "Ta da!" yelled his brother, swinging open the door. "Whatchadooin?" "We're meditating," said his brother. "We're listening to this lady, and you're bothering us!" "You want to meditate with us?" I asked. "Shoor!" he shouted, and threw himself on top of me. Sharon continued to talk us through the meditation, while each child wriggled and giggled. We didn't even make it to the nine minute mark before I decided to call it quits. Then, we devolved into a brief wrestling and tickling session (I wonder if they do that in the monasteries!) Sometimes, the present moment doesn't arrive precisely as we expect...and it can still be pretty fun. Later, once the kids were in bed, I revisited the meditation, and got 15 minutes to focus on my breath. I was sleepy during the meditation, and I might have dozed off for several seconds periodically. Once it was over, I did feel more energetic, though. Nice. Sharon’s teaching that each falling-away from focus is to be embraced as it offers a chance to begin anew, was today-- and has been-- critical to my life with meditation. Sharon, I can hear your soft, compassionate voice saying those words even when I’m not listening to the guided meditation. Thank you. Meditation is for me (an over-achieving, extroverted, anxious-to-please, well-educated in western, aka patriarchal values, baby boomer) growing my other half, toward wholeness, happiness. Copyright 2012 Feminist.com. All rights reserved.